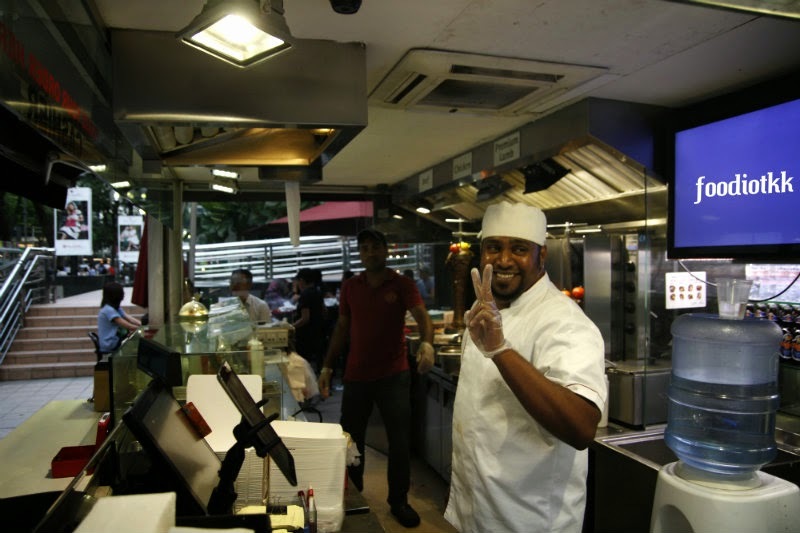 The definition of Halal food in Singapore perhaps is a little bit different than in Malaysia. Shiraz Mazzeh is a Middle East-Persian food outlet but they do offer beer, not in the food (which is certified Halal), but in bottle behind the bar. I somehow believe that (Halal or not) is between you and God, not third party. You do get what I mean, don't you? 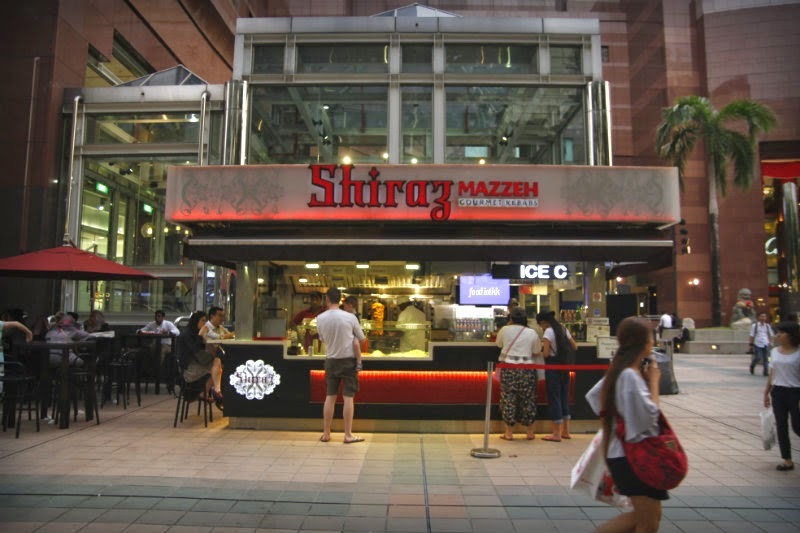 Shiraz Mazzeh is a food stall located right in front of the upmarket shopping centre Ngee Ann City （义安城）along the Orchard Road. The word "Mazzeh" means small food stall, and people are gather around the stall for food. Shiraz Mazzeh offers some Gourmet Kebab, German Sausage, some Middle Eastern side dishes such as Falafel (deep fried chickpeas) and drinks. 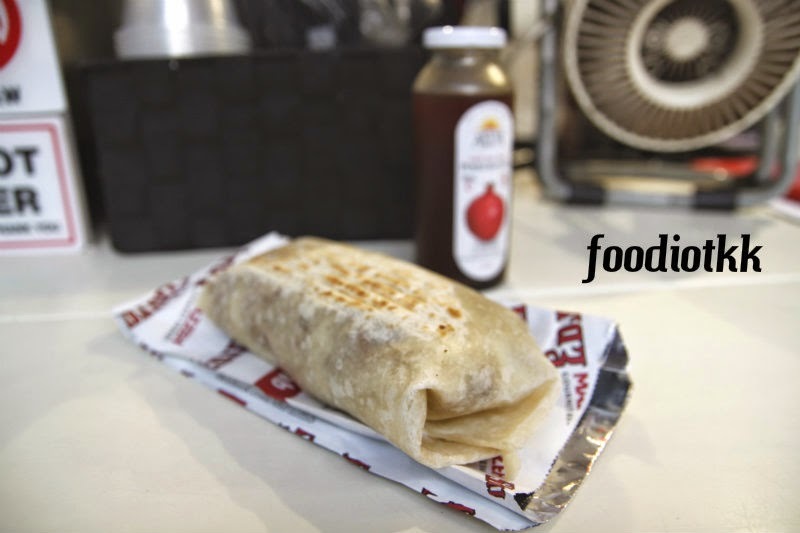 For the kebab, diners can choose from Chicken, Premium Lamb, Beef or Falafel. I ordered an a la carte Premium Lamb which cost me SGD10.50 and a bottle of Chilled Fresh Pomegranate Juice (SGD4). You might opt for the Set Meal which is included a can of softdrink and fries. The moment I took a bite on the kebab, immediately I regretted that I didn't request for additional cheese and sauce (++ SGD, of course). The meat is quite tender, but there is still room for improvement. Extra cheese might be the answer, according to my experience with Kyros Kebab in KL.